Camera glasses have been a dream gadget for most of the youngsters. Well, sometimes for adults too as it is a hell of a cool one. 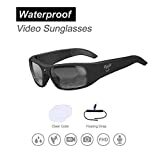 Whether you are going to a zoo or to a secretive place these glasses will help you record anything that you see. 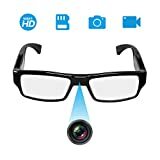 The glasses have miniature cameras with incredible hardware to capture everything in front of you within seconds. Also, most of them support up to FULL HD 1080p recording, thus providing an incredibly high definition video capture than the convention. Well, if you are in need of such glasses, don’t worry. We have with ourselves the top 10 best camera glasses in 2019. This is a really cool eyeglass which has a very small and completely cloaked out camera hidden in the bridge. It is way smaller with a small f/2.6 lens, a mere 5MP camera. One of the coolest features is that it is 100% not noticeable at all. It can record up to 1080p FULL HD videos for around 2 hours at a stretch. The camera glass comes with support for micro USB charging. You can charge it from anywhere with a USB port. In terms of memory, it supports up to 32GB (class 10 grade) SD card for an incredible amount of space. The lenses are too good for overall clarity vision and no strain to the eyes. The Charging port can be used for accessing the recorded footage. You will be able to carry it anywhere, anytime in places where cameras are not at all allowed. Comes with High Definition 1080p recording for at a stretch two hours. Very light with strong build, cloaked camera on the bridge. 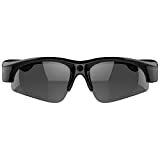 The Hereta Spy camera glasses name itself on being an actual spy glasses with completely ordinary looks. There is nothing suspicious about the camera, as most of the hardware is inside. There is a single micro camera on the left frame, which is power operated. The button is inside the frame, which has multiple functions. Mostly, a long press switches to video recording, short presses get the photo shots. The camera is backed up by a big 0.25inch CMOS grade sensor for exceptional video quality. It also supports 1080p recording at 30 fps. It also comes with a line indicator LED. The glasses can be charged up via the USB port on the right frame. The Hinges provides the SD card slot, it also supports up to 32GB sizes. Multifunctional shutter switch for photo and video resets. Up to more than two hours of recording. Completely natural body design for suspicionless performance. If you are not afraid of doing the spy work and want to look cool enough, this camera glass is for you. It comes with special UV filtered glasses and a wide angled camera on the bridge center. It looks incredible, mostly a special high tech eyeglass. Mores, it has a 5MP camera, that can take photos and do the 1080p recording for around 1.5 hours (sometimes more). The 1080p provides incredible detailing, also fit for snapshots from the footage if required. It is bit shockproof, so it will not get shattered when dropped. Coming with a micro USB port for charging and data access, it has something else. The lenses fitted are external industry grade sunlight intensity dimmer, so you won’t feel irritated if it’s a bright sunny day. Special sunlight diming lenses for a better view. 5MP 1080p camera for better capture. Integrated controls right in the frame body for better access. 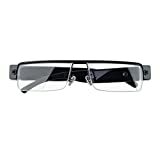 If you are concerned about more of the photos than video footage, this is your ideal camera glasses. WHY? 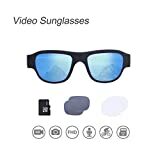 This OHO video sunglasses come with a huge 16MP camera for exceptional high-quality detailed photos, which might be worth sharing. It also comes with 1080p video recording too, which adds to its features. It also comes loaded with a 16GB SD card. Well, the 16MP capture and processing to take up a lot of power. The glass is able to provide just an hour of the capturing fun. Coming with rechargeable batteries, you can charge it up within minutes and continue again. It has a light blue tint coated lenses, so if you are on to beaches, the sun won’t kill you down. Specially tinted lenses for 100% UV protection, EM ray filter, better view. Incredible 16MP photo capture for high-grade detailed photos. 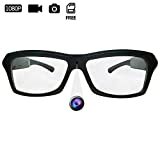 We have another great camera glasses which has actual spy grade hardware. First, the lenses are no ordinary lenses. 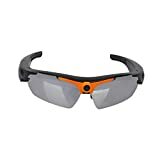 These have UV filters, so no harm to your eyes at all during outdoor time. The frame can handle high stress and terrain with extreme flexibility. Secondly, the bridge of the glass has a small pinhole which is the camera. The lens has been designed a bit smaller to adjust with high brightness surroundings, for getting better footage. The left frame has a shutter button, which on long press activates video. The micro USB port can both used for charging and getting the videos. Completely ordinary looks with a un-noticeable pinhole camera on the bridge. Up to two hours of recording on a single charge. Sounds just like the famous GoPro cameras, this GoVision Pro 3 ultra camera glass is one of its kind. Coming with a next-generation 16MP micro camera, it has a lot of features. And Like actual cameras, the module has Image Stabilization. Now you are free to move on as you like, as videos turning out blurry or shaky is not an issue anymore. Plus, it has 1080p 30fps video footage capture. You can even snapshot the video for quality photos at still good resolution. It also comes with a multipurpose shutter button inside the frame, LED indicator, a distortion-free microphone for better sound recording too. Also, it sports a separate reset button, up to 32GB SD card storage support, a dual purpose micro USB port for data transfer. 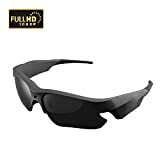 The lenses are too light black tinted(with all body structure) to protect you from strong UV rays, EM radiation, and strong light. Better lenses than most of the camera glasses. A great 16MP micro camera with Image Stabilization. Up to 1.7 hours of footage recording. Camera glasses are widely common, but getting one at a low price is a problem. If you are in the same dilemma, then this product will satisfy you. Costing only just $65, this is the coolest camera glass you will actually find anywhere out. It comes with tri-attached black tinted lenses which give you a completely new look. The lenses are also UV protected too. Apart from these, the buttons and the accessories look incredibly brilliant. There is a standalone shutter button for photo clicks on the left frame, which is highly easier to reach out. On the other frame, there is a single reset button, a cover for it too, LED indicators for video and charging. It comes with high definition FULL HD 1080p recording at solid smooth 30 frames per second via the camera. And for storing all the high definition footage, there is an SD card slot, support up to 32GB. Incredibly cool stylish and futuristic looks. Better lens than most glasses. Comfortable shutter button, for better performance. Here we have another ordinary camera glass which just looks more of a flight goggle. This one too has gray tinted lenses which protect you from the excessive intensity of sunlight, along with strong rays and UV. On the technical side, it has a similar bridge mounted pin camera that is actually a bit noticeable. But not that much. The glass comes in full sports black(and the lenses look just amazing). Most importantly, it is waterproof. So, if you are planning to go diving or swimming, this glass might be your dude. Coming with a 5MP camera along with one touch 30 fps FULL HD 1080p high definition recording, it has the goods along with an expandable 32GB memory. It also durable rims for holding the lenses during vigorous activities. Tinted lenses for a better and protective view. Waterproof lenses and hardware(along with USB data transfer and charging). These Gogloo lens glasses are the most extraordinary glasses, designed for extensive photography purposes. There is a pin camera on the bridge of the frame, which is mostly unnoticeable. The other accessories are situated on the frames. The most important thing about its 10MP camera is that it is well suited for shooting in any lighting as it has a new E6 camera sensor. Whether day or night or dim light, your photos or videos will never get out of quality. The camera can shoot in low light too, for best possible shots. You won’t be compromised by the footage quality at all. Also, it has better controls, side shutter, and charging/data access port via USB. Better E6 sensor for extreme grade photo and video capture with extreme quality. Up to 1.5 hours of backup from a single charge. More like Snapchat camera glasses, this one has far better features and productivity than those googling spectacles. With a better flexible body design and waterproofing structure, you can take it anywhere you want. It comes with a fisheye round capture lens camera, the spectacles 2 glasses has amazing features to cherish. While most of its ports are hidden inside the hinges (including the USB charging port and the SD card slot), the shutter buttons are on outside. The body frame is complete black along with tinted lenses for better light filtering and polarization. On the video side, you can actually shoot small videos of special moments rather than long ones too(time lapse). And you can shoot 70 of them all together after a full charge. Waterproofing design for the ports too, very light. 1080p 30 fps high definition recording.